Dr. 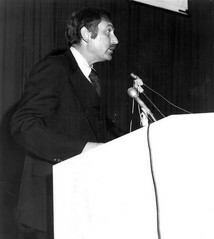 Guy R. Newell, former acting director of the National Cancer Institute, standing at a podium speaking at the National Cancer Institute's 40th anniversary ceremony in 1977. The NCI, established under the National Cancer Institute Act of 1937, is the federal government's principal agency for cancer research and training.